VATICAN CITY (CNS) -- Today's narcissistic culture leads to sad souls who worry more about keeping up appearances than caring for others, Pope Francis said. Speaking to young people of the Shalom community, Pope Francis warned them of the sadness caused by narcissism, when "you live worried about putting makeup on your soul, about looking better than you are, about contemplating whether you're more beautiful than others." "It is the sickness of the mirror," the pope said. "Young people, break this mirror!" "Don't look at the mirror because the mirror deceives," he said. "Look outside, look at others, escape from this world, from this culture we are living in that is consumeristic and narcissistic." 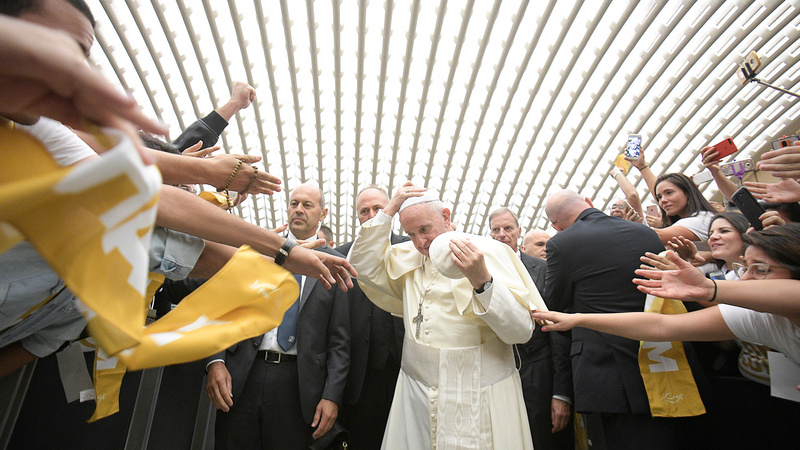 The pope met on Sept. 5 with an estimated 4,000 young men and women from the Shalom community. Founded in 1982, the group is comprised of married couples, celibate individuals and priests living out their faith through communities based on contemplation, unity and evangelization. According to the group's website, the Shalom community has missions in 17 countries, including the United States, Israel, Brazil, France and Madagascar. Juan, a young man from Chile, spoke about finding meaning in his life by praying, sharing and evangelizing. Those three characteristics, the pope said, are "verbs of movement, of coming out of yourself" to share the good news of God's mercy "in a world marked by desperation and indifference." Christians, he added, are called to proclaim the love of God who, like the father in the parable of the prodigal son, waits for his children "even in life's worse moments." "That son was in the worst of sins, in the worst of situations and when he said, 'I will go to my father,' the father was already waiting for him," the pope said. "That is mercy, to never lose hope. Additionally, it looks like our God has a special preference for sinners." Responding to Justine, a Shalom member from France who was baptized during the Year of Mercy, the pope said proclaiming the joy that comes from God can help young people today who are living "centered only on themselves." "A young person who looks at himself, who lives only for himself, ends up -- and I hope you understand the verb, because it is an Argentine verb -- 'empachado' (stuffed) with 'self-referentiality,' meaning, full of self-focus," he said. Pope Francis said that instead of looking at themselves in the mirror to see how impressive they are, young men and women should instead "look into the mirror to laugh." "Try it one day: look, and start to laugh at what you see there, it will refresh your soul. Knowing how to laugh at yourselves gives joy and saves us from the temptation of narcissism," the pope said. Recalling the experience shared by Mateus, a former drug addict from Brazil, the pope warned that drugs are one of the main instruments "used to dominate us," and drug use uproots people "from your family, from love, from everything." The pope called on young men and women to connect with their roots and to "give freely what we have received." "If you are here, if we are here, it is because we were freely brought here. Please, let us give freely what we have received," Pope Francis said.